The Dalai Lama, Tibet's spiritual leader, attends a special prayer session at the Mahabodhi Temple in India on January 10. NEW: Obama to meet Dalai Lama in his capacity as a "respected religious and cultural leader"
China warns a meeting between the two would "seriously undermine Sino-U.S. ties"
Beijing, China (CNN) -- President Obama intends to meet the Dalai Lama even though China has warned that such a meeting would harm bilateral ties, a White House spokesman said Tuesday. "The president told China's leaders during his trip last year that he would meet with the Dalai Lama, and he intends to do so," Bill Burton told reporters covering Obama's planned town hall meeting in New Hampshire later Tuesday. No date for Obama's meeting with the Tibetan spiritual leader has been announced. 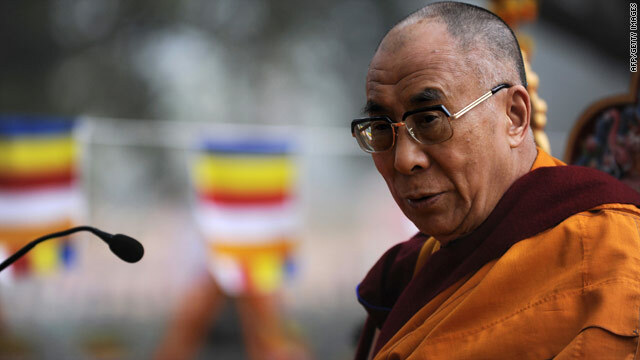 The Dalai Lama has speaking engagements scheduled in the United States in late February and in May. Earlier Tuesday, China warned that ties between two of the world's superpowers would be strained if Obama met with the Dalai Lama. "It will seriously undermine the foundation of Sino-U.S. political relations," said Zhu Weiqun, a Communist Party official who is in charge of talks with representatives of the Dalai Lama. "We will take corresponding action to make relevant countries see their mistakes." Zhu issued his warning during a news conference to discuss the lack of progress made during five days of talks between China and the Dalai Lama's representatives. Beijing accuses the Dalai Lama of advocating for Tibetan independence from China. "The two sides had sharply divided views," Zhu said. "We have been accustomed to such clash of viewpoints. It's been the norm rather than the exception." In explaining Obama's intention to hold the meeting, Burton said the Dalai Lama "is an internationally respected religious and cultural leader, and the president will meet with him in that capacity. "As the president has expressed, we expect that our relationship with China is mature enough where we can work out issues of mutual concerns -- such as climate, the global economy and nonproliferation -- and discuss frankly and candidly those issues where we disagree," Burton said. "The president is committed to building a positive, comprehensive and cooperative relationship with China." Tibet is technically autonomous from the central Chinese government, but the Dalai Lama and others have said they favor genuine autonomy and resent the slow erosion of their culture amid an influx of Han Chinese, the most numerous ethnic group in China. Zhu said there would be no compromise on China's control of Tibet. Representatives from the two sides have met eight other times, but have reached no consensus on the issue of autonomy. The Dalai Lama fled China in 1959 after a failed uprising against Chinese rule. He lives in exile in the north Indian hill town of Dharamsala. Burton said the United States "considers Tibet to be a part of China, and we have human rights concerns about the treatment of Tibetans." "We urge the government of China to protect the unique cultural and religious traditions of Tibet," he said. CNN's Jaime Florcruz and Helena Hong contributed to this report.